We started out Thursday night heading out into the middle of nowhere South and West of Tooele Utah. 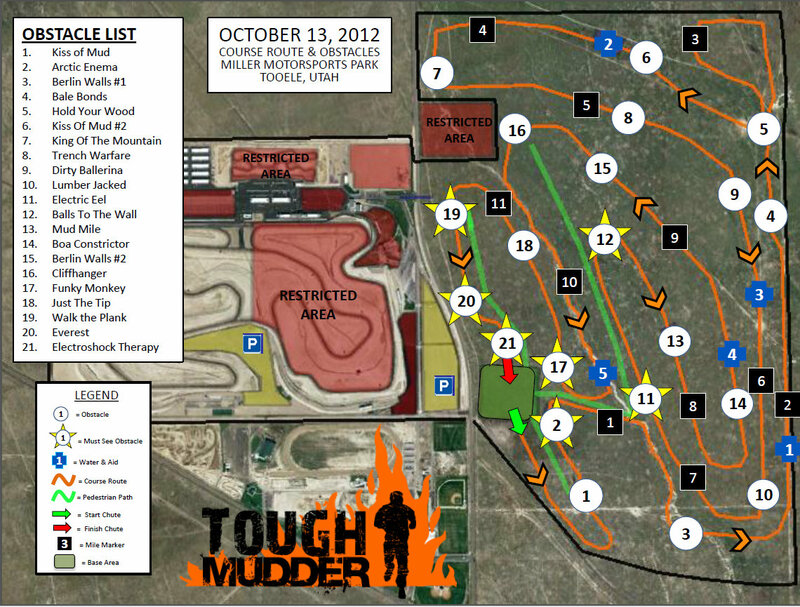 Tooele is where the Tough Mudder was, and it's already middle-of-nowhere-enough as it is! We arrived at the Lookout campsite in the dark, set up our tent, checked out the GORGEOUS stars, and went to sleep. In the morning we woke up, got my brother off and running, and started our fun! I don't need this yet! Two(ish) hours in - SO happy! Jeans and a running tank - that's hot. 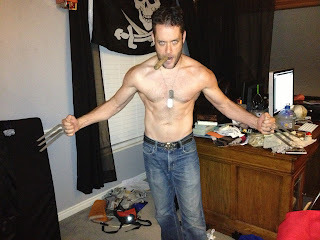 I knew I'd be pacing soon, so I stripped down the layers (seen previously) to my running stuff and got ready. Kakes paced first - he was starting to get more tired as he had already passed a Marathon distance. At mile 31 I started running with him, right as his hip was starting to bug him so we started off (well I started off, he'd been going THIRTY-ONE miles already!) quite slowly due to the hip issues. Kakes hopped in the van with Alicia a few miles later. The hip issues caused some calf issues and some knee issues - but eventually, (and with the help of my amazing wife!) 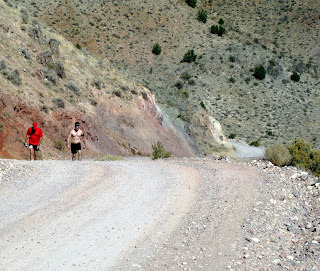 it worked out, and we really got moving again after Dugway Pass. Around here I told him "I plan on pacing you as long as I'm not slowing you down" and he replied, "Yeah that probably won't be a problem!" A few miles later my sister and her husband showed up, and my brother in law Ben jumped out to run with us. 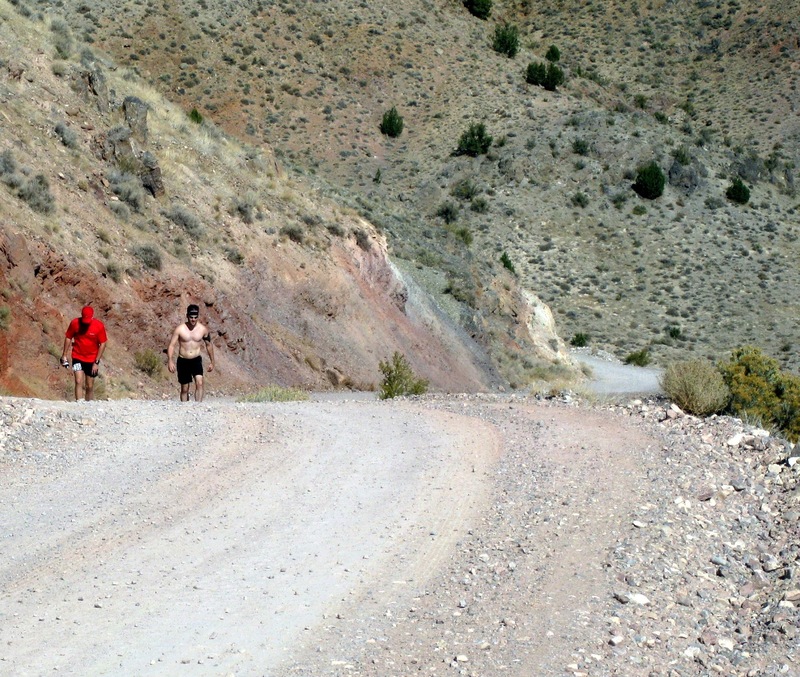 Matt was moving a lot better here - and I was getting close to my all-time longest run ever. (14 miles last year in the half marathon I got lost in!) And my knee was starting to tweak a bit. So Kakes parked the van, and everybody got out to run the final 1.5 miles. I actually slowed WAY down and basically hobbled the last 200 yards or so. My knee was NOT very happy with me. Considering I had just run 18.91 miles straight (not including all the dancing and yoga and crew-running done earlier) I felt pretty good! I know I could do a marathon if I wanted. Who knows. Maybe someday I will! We collapsed into chairs at the Finish Line almost 10 hours after we started. Kakes is awesome and took care of us with stuff we needed from the van. We ate some of the Argentine BBQ that was being prepared at the finish, and talked to a few runners, pacers, organizers, and took some pictures. 19+ miles, sunburned, still alive! Thriving! and went back and packed up the Tent and bedding we'd left at the start-line campsite (yay for people not stealing anything!) ((Not that I expected them to - I'm still happy about it sheesh!)) It got dark fast! Great adventure for a fall Friday! Saturday morning I woke up feeling a little sore, but not bad at all! 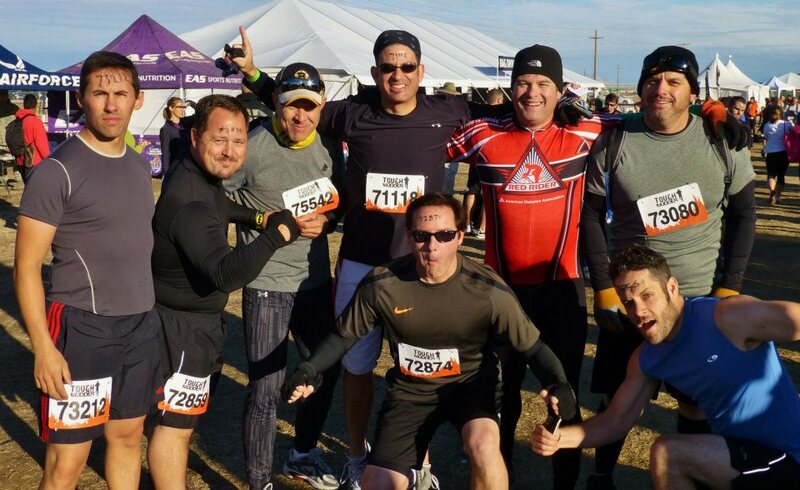 I still have no plans to run a Marathon, let alone an ULTRA marathon, but it was a blast crewing for my brother as he ran this 50 miler. Now to catch up with the rest of the week! 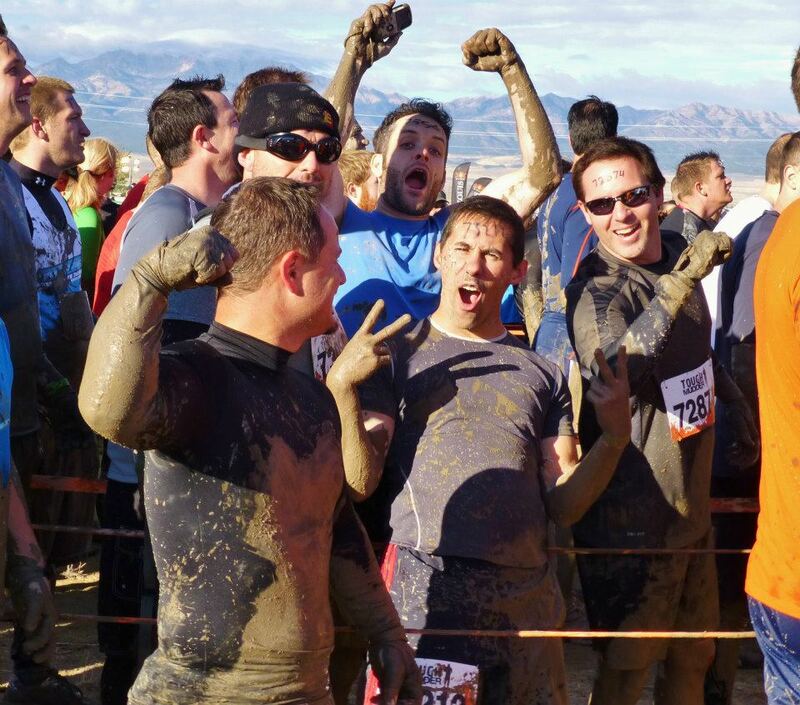 As you know, since I've been talking about it for a long time now, yesterday I was able to take part in the Tough Mudder Event. On Friday I said "My main goal is to conquer most of the obstacles without assistance" and if that word 'most' is taken into account - then I definitely did it! I only fell on ONE obstacle! We met up and left at 7:30 to get out to the Event Site an hour before our 9:20 start time. Checked in and they wrote our number on our forehead. I wasn't too excited about that, for some reason I don't like having things written on my forehead! It was COLD! As the sun was coming up it was getting better though. Jumped over the 6 or 7 ft wall to get into the start area and listened to the intro rules and everything by the course MC. Cool guy. Then we counted down and started the course! Here's a map so you can follow along! Since there was so many people it really took a bit to get moving and then we made it to the first obstacle - "Kiss of Mud"
Next was one of the most dreaded Obstacles - "Arctic Enema" I know - it's a horrible name. It used to be called "Chernobyl Jacuzzi" - but I think somebody must have complained, so now it has the even worse Enema appellation. Anyway - I held my camera and videoed the experience so you could see it too!! Next were "Berlin Walls" (part one) which were about 8-10 ft tall walls you had to get up and over. Twice. Easy Peasy - seriously, if I had to choose a workout to best prepare, muscle-ups have been the best preparation for most of this stuff. These walls were EASY. and hit the next obstacle - "Bale Bonds" - big rolls of hay to climb over. The 5th obstacle was "Hold Your Wood" which was probably my least favorite event. 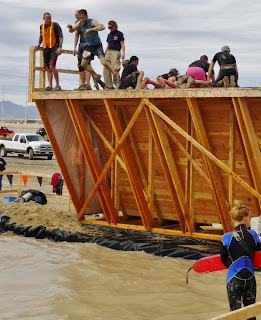 We took a GIANT and heavy log, and I have bruises from where it dug into my shoulders, along with wrist problems from holding the log with our team mates and coordinating the effort. Yikes! Next was another Kiss of Mud, then we ran to King of the Mountain... which was just a pile of large hay bales. Next up - "Trench Warfare" some pretty tight tunnels with a turn in the middle that made it pitch black in the middle. They dug out the trenches, then covered them with boards, dirt, and a TON of dead animal carcasses and bones! It was pretty cool - but could be really difficult for people if it went on much longer. As it was I saw a few that couldn't do it. Trench Warfare was followed by the "Dirty Ballerina" which was a lot of fun. 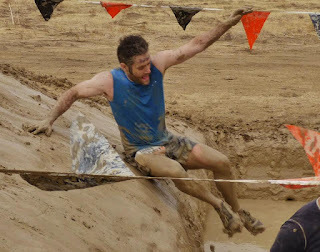 You could probably get a good enough start to jump over the muddy water pits/trenches, but it worked best if you jumped far into the water and immediately slapped your hands onto the other side and vaulted out. 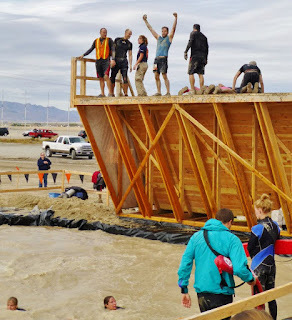 Often we'd jump in and out and turn around to help out our fellow Mudders. Great sense of camaraderie! 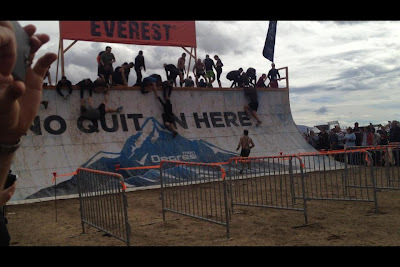 Then there was the first of my 2 least favorite obstacles. The "Electric Eel." Eels are something I very much dislike (But love to eat! Yum!) and apparently my body does not like excess electricity. 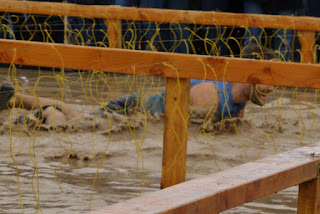 In this obstacle you crawl under barbed wire like "Kiss of Mud" but in this there is more water, and dangling electrical wires. I made it halfway through before I got my first jolt, and I about cracked my jaw in the clench that resulted. Got shocked 2 more times on the way out - feels like somebody hit me in the brain with a hammer. Yeah I didn't like it. 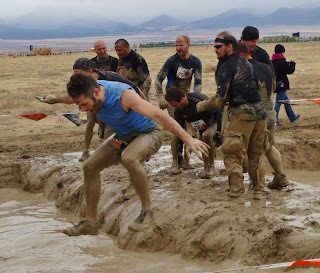 Especially since I started to exit the obstacle with my hand in a puddle and got shocked about five more times. Blech. Still - I could handle this as an obstacle again - it wasn't THAT bad. I still didn't like it much. "Balls to the Wall" was next - Fun but not too difficult LARGE Plywood wall with ropes up and down. Waiting in Line to climb up the ropes! 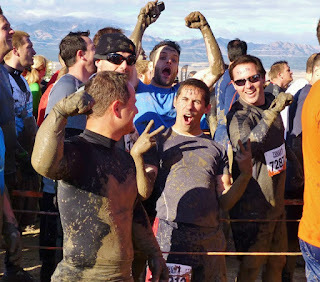 Up next we had the chance to do a "Mud Mile" Which wasn't really a mile - but it was a lot of fun! This is one of the obstacles that really required team work and help - and it was fantastic! Nice and muddy and fantastic! "Berlin Walls" (part two) came next - THIS one was awesome. There was a similar wall at Cahoots, but it was busy and I didn't have time to mess around with it - but THIS time I wanted to do it on my own. 12' walls with a little lip down at the bottom - I made it no problem when I really tried. Just had to step quickly off the lip and not try to step ON the lip. "Cliffhanger" was next - they had music at this, and it was a lot of fun. Big 4 ft deep water pit at the bottom of a steep muddy wall with a cargo net. Not too hard. There were more steep hills right after a few other obstacles - these without the nets took a bit more teamwork - and this was where our guys excelled. 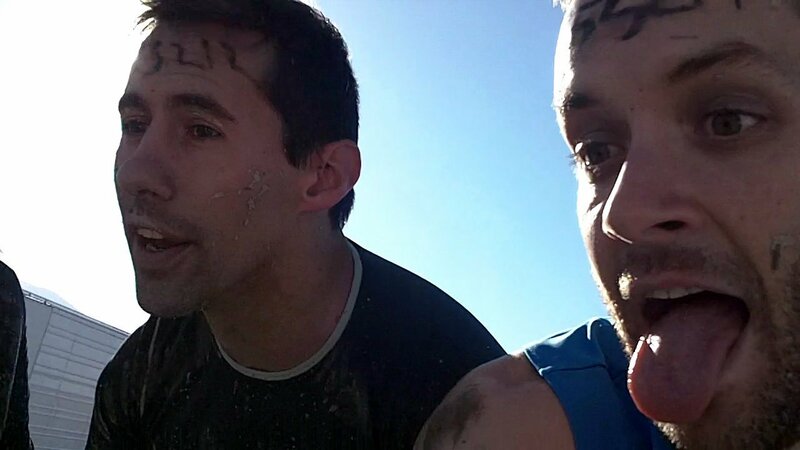 They may not have been the fastest or the flashiest at finishing obstacles (well... Justin and I were pretty awesome at the obstacles!) but they were good at helping others get up the tough parts! Next up - one I was particularly excited about - "Funky Monkey!" I wanted to conquer this one - because I'm pretty good at pullups now, and I didn't want this to beat me. It didn't. It was actually too easy. Still - I want one in my back yard! Yeah! Easy as pie! Fun too! Finally we came to the one obstacle that humbled me a little. I didn't make it across. "Just The Tip" is a big sheet of plywood with two boards at foot and chest level on it, 5 feet deep water pit below. The first 3rd of the wall had normal boards about an inch thick, then the next 3rd was skinner, about half an inch,then it was back to the normal size. I made it about halfway and I couldn't do it anymore. If you look up Just the Tip on YouTube - a lot of them don't have the water pit - and in most of the videos people do it by grabbing on the top, or just climbing up to the top and getting across that way. Huh. I could have done that - but I want to be able to do it the right way!! So yeah, failed on that one - but I did say MOST so I'm not too unhappy. 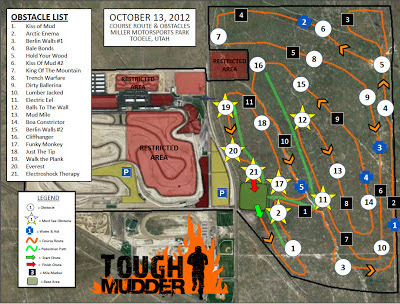 Second to last was one of the other obstacles I was both looking forward to and slightly dreading. "Everest" - I really wanted to be able to do this one on my own without help. Having watched videos and seen pictures and seen how many people CAN'T do this without help - I know that once people finally get up they are very willing and eager (often tooooo willing and eager!) to help people conquer Everest. I figured if I did have a problem doing it on my own it would be because people were trying so hard to help. At the same time - I did want to have help if I needed it, and having never done something like this before... I had no idea. From watching American Ninja Warrior and various other Freerunning and Parkour Training vids (like this one from DemonDrills) I thought I would be able to handle it. So I started running, and had no problems at all getting up and adequately grabbing the top to pull myself up (AGAIN - hooray for muscle-up training! Seriously helpful!) 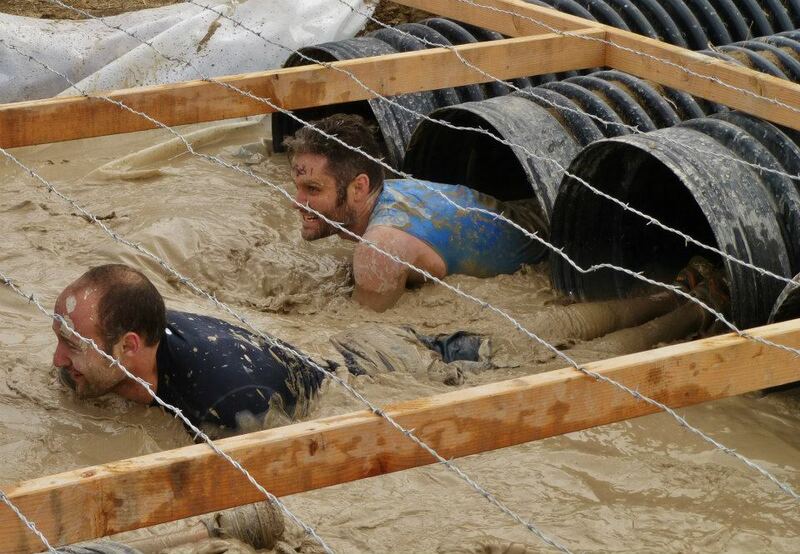 BUT like I feared, immediately a couple of well-meaning Mudders started trying to grab and pull me up. I told 'em I was fine, and pulled myself up, then went to be ready to help my team - telling the same people who tried to help me that it was fine to be ready, but the next guy (Justin who I trained with a lot for this, and who (like me honestly) was more ready for this than the others on our team) probably wouldn't need (or want!!) help - so he did it fine too. Booyah! Such a good feeling to be capable of that stuff. I REALLY hope somebody got a picture of that! Here's a picture of one of our teammates - a great, but short member of our team finally making it up Everest. This was difficult for a lot of people! I'm in blue reaching down grabbing him to pull him up! Finally was my least favorite obstacle. "Electroshock Therapy" - I really didn't like this one that much. 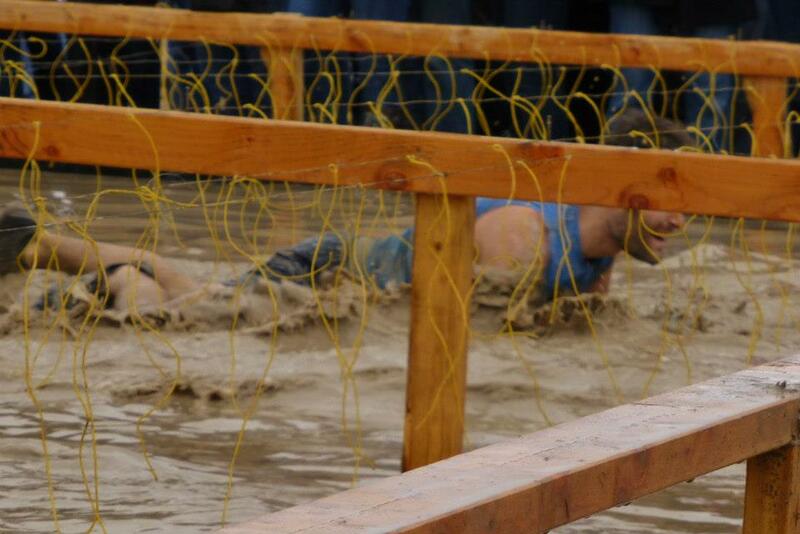 As of right now if I were to have the option of doing a Mudder again I wouldn't because of this one obstacle. In a couple of months- maybe I'd answer differently - but looking at pictures of that makes me hurt. Hammers on Brains. Ouchies. Here's a video of kind-of what it was like. In all these videos the sound isn't great because there was too much mud in the mic! I think it's permanently damaged now actually... HA. And they got lots of muddy shoes! Not mine though! I kept mine. They've been through too much with me this year! They also got lots of money. This race was expensive!! 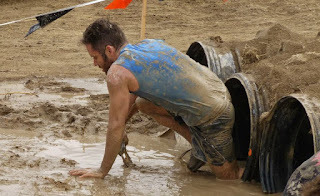 Next year I might try the Spartan Race instead. It's the same weekend, and there is a deal on it right now. We'll see!! Either way - I'm excited for more challenges! This one was ultimately FANTASTIC!